VANCOUVER, BRITISH COLUMBIA--(Marketwire - April 28, 2008) - Oro Silver Resources Ltd. ("Oro Silver") (TSX VENTURE:OSR) has received final results for a portion of its underground channel sampling recently completed at the Vetagrande Mine property in Zacatecas, Mexico. Two hundred and seventy-three 1-metre samples, in 38 channels, were taken from the accessible portion of the 275m level of the historic mine, mainly from the haulage drift and cross-cuts. - Average grades for all channels (vein & wall rock): 145.8 g/t silver, 0.65 g/t gold, 3.39% zinc, 1.39% lead, and 0.12% copper. - Average length of all channels: 2.44 metres. - Strike length of continuous vein and wall rock sampled: 1,050 metres. Select channel sample results are provided in the following table. All results are true width intervals. A total of 38 channel sample lines were taken from the 275m level, along 1,050 metres of the accessible portions of the haulage drift and cross-cuts, representing approximately 50% of the historic development on that level. Channel sample lines were spaced at 25 to 50 metres intervals and cut perpendicular to the strike of the drift vein. Veins dip steeply to the southwest and vein channel sample widths are considered to represent the true vein thickness. Each channel is comprised of a series of 1-metre length samples. The locations of the channels are illustrated on the attached figure. The vein system extends in a northwest-southeast direction. Surface mapping and sampling strongly supports the premise for additional mineralized shoots along more than 2 kilometres of strike length. Sub-parallel vein systems remain to be sampled. Results from both the on-going surface and underground programs will aid in defining targets to be drilled in the third quarter of 2008. The Vetagrande system consists of multiple sub-parallel silver and base metal-rich epithermal veins, characteristic of the Zacatecas district. 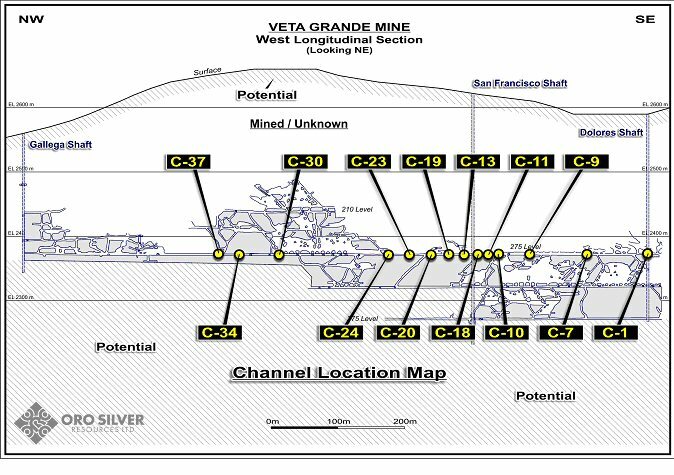 Oro Silver's results obtained to date are consistent with historic grades (non-NI43-101 compliant) reported by Industrias Penoles S.A. de C.V. in the 1980's for the Vetagrande mine (see Oro Silver's press release dated January 18, 2008). Oro Silver's exploration program is supervised by Mr. Herve Thiboutot, P. Eng. and Vice-President of Exploration and Development, and Dr. Charles Tarnocai, Chief Geologist. Mr. Thiboutot is a qualified person as defined by National Instrument 43-101. Mr. Thiboutot has reviewed the content of this press release. Oro Silver maintains a strict quality control program. All samples were submitted directly to Inspectorate de Mexico, S.A de C.V., for preparation in Mexico, and analysis in Reno, Nevada. Analysis was conducted on 1 assay ton samples, with standards and blanks inserted every 30 samples. Analysis of gold was by fire assay, with a gravimetric finish on samples exceeding 3 g/t gold. Analysis of silver was by atomic absorption, with a gravimetric finish on samples exceeding 200 g/t silver. Samples exceeding 10,000 part per million for copper, lead, or zinc were analyzed by a gravimetric finish. Triple acid digestion was used on all samples. Oro Silver is a silver exploration company pursuing early and advanced stage silver-based opportunities primarily in the western hemisphere. The company is focused on (i) developing resources and optimizing milling processes at its El Compas and Vetagrande Mine projects in Zacatecas, Mexico, and (ii) completing additional strategic acquisitions. Oro Silver's strategy is to become a mid-tier silver producer through an aggressive acquisition and development plan focused on advanced-stage projects with known silver resources that exhibit potential for expansion. Some statements in this release may contain forward-looking information. These statements include, but are not limited to, statements with respect to future exploration, development and production activities and future expenditures. These statements address future events and conditions and, as such, involve known and unknown risks, uncertainties and other factors which may cause the actual results, performance or achievements to be materially different from any future results, performance or achievements expressed or implied by the statements. Such factors include, among others, the time and success of future exploration, development and production activities and the timing and amount of expenditures.